Happy Fall! I am writing this in the heat of summer and I hope that by the time you are reading this message, it will be cooler and wetter in most places. The Annual Conference in Anaheim was a resounding success and RUSA had a number of wonderful programs as well as productive meetings. Topics covered in our programs included: making decisions about e-books, international interlibrary loan, return on investment (ROI) for virtual reference, the 1940 Census, library services to Baby Boomers and older adults, discovery systems, integrating social media and online marketing, business data sources, and many more The MARS Chair’s Program was selected this year to serve also as the President’s Program. Entitled Library in Your Hand: Mobile Technologies for Exchanging Information with Patrons, it provided an overview of the advantages of communication with library users through mobile devices, presented by Joan Lippincott, and descriptions of exemplary programs at North Carolina State University (Kristin Antelman) and Topeka Public Library (David Lee King) A video of the program is available from the RUSA web site at http://www.ala.org/rusa/rusa-presidents-program-video. It is posted in two parts. RUSA 101, our introduction to new members, was a rousing success. The room had to be changed because so many people indicated in the Scheduler that they planned to attend and the new room was filled to capacity. The excitement was strong! Congratulations to Liane Taylor and her committee for their wonderful session. This year, we experimented with the venerable Literary Tastes program. This program has traditionally featured authors and free books. Instead of a paid breakfast, this year it was a RUSA program. I really wished that I could have the authors who spoke talk to incoming freshmen at my university. They spoke with passion about their work and their research, making their books and the work of writing them come alive. We were pleased to feature: Erin Morgenstern, author of The Night Circus; Candice Millard, author of Destiny of the Republic: A Tale of Madness, Medicine, and the Murder of a President; Mark Adams, author of Turn Right at Machu Picchu: Rediscovering the Lost City One Step at a Time; and Russell Banks, author of Lost Memory of Skin (and a shortlisted title on the Carnegie Award fiction list). One might call 2011-2012 the Year of Awards. With Booklist and the support of the Carnegie Corporation, RUSA co-sponsored the first-ever awards for the best work of fiction and of non-fiction for adults published in the United States in the previous year. This year’s inaugural winners were: Anne Enright who was awarded the Andrew Carnegie Medal for Excellence in Fiction for her novel The Forgotten Waltz, published by W. W. Norton & Company. Robert K. Massie was awarded the Andrew Carnegie Medal for Excellence in Nonfiction for Catherine the Great: Portrait of a Woman, published by Random House. We salute them both. The other nominated works were great books as well. Check out the full list under About the Awards. RUSA gives out many awards each year at the Annual Conference—to RUSA members, to libraries and librarians for excellence in service, to authors and publishers. The full list can be found on the RUSABlog. Please join me in congratulating all of the winners. This year RUSA sections created two new awards, the BRASS Business Expert Press Award for Academic Librarians and Gale Cengage History Research and Innovation Awards. We said thank you and “well done” to our outgoing Reference and User Services Quarterly (RUSQ) editor, Diane Zabel, as she ended her term and welcomed the new editor, Barry Trott. Under the leadership of Gary White, 2011-2012 RUSA President and the Executive Committee, the RUSA Board developed a new three-year (2012-2015) Strategic Plan. The plan focuses on membership and membership benefits, professional development, marketing and outreach, and increasing the effectiveness of RUSA as an organization. A subcommittee (Alicia Ahlvers, Emily Hamstra, and Emily Kornak) reviewed the results of last year’s RUSA membership survey and made recommendations to the Board. They were a good complement to the RUSA Structures Task Force Report from the committee chaired by Kate Kosturski presented to the RUSA Board at Midwinter. We will use this information as we move forward on the RUSA strategic plan. This summer our newly elected officers and Board members are beginning their work of planning for activities that will occur over the next year. Congratulations to Kathleen Kern, Vice-President/President-Elect, new Directors-at-Large Cynthia Levine and Celia Ross, and new Division Councilor Jennifer Boettcher. Continuing on the Executive Committee are Carolyn Larson, RUSA Secretary, and Gary White, RUSA Past-President. On the RUSA Board Wayne Bivens-Tatum, Judy L. Solberg, Doris Anne Sweet, and Patrick Wall, are Directors-at-Large. The 2012-2013 RUSA Board of Directors also includes section chairs: Ann Fiegen (BRASS), Mary M. D. Parker (CODES), Sara E. Morris (History), Deborah K. Bezanson (MARS), Sarah Hammill (RSS) and David Atkins (STARS). I look forward to working with them as we plan for your programs and services in RUSA this year. Congratulations, too, to the new section Vice-Chairs/Chairs Elect—Andy Spackman (BRASS), Asia Gross (CODES), Michelle Baildon (History), Sam Stormont (MARS), Ann K. G. Brown (RSS), and Nora Dethloff (STARS). Our first steps in the coming year will be to look at the new Strategic Plan and develop action plans to move forward on important parts of the plan. Using some of our reserve funds, we have put our money where our priorities lie, bringing Collaborate web-conferencing software into play for webinars, committee meetings, and many other things we haven’t yet dreamed. We also will sponsor a separate President’s Program. Mary Mintz and Joe Thompson are hard at work with their excellent committee to bring you a program that will dazzle! This year I plan to begin a comprehensive look at our continuing education, publications (including the web site), communications with members, and programming to see if we can identify priorities, fill gaps, and meet your needs. This would not be a proper initial message without saying thank you to many wonderful people! Thank you to Gary White, who led RUSA over the last year so that it accomplished many goals and began initiatives leading to changes that will make RUSA more responsive to members. I also send a personal thank you to Gary for his kind and patient guidance. Thanks to outgoing RUSQ editor Diane Zabel. She charted a course that has led to a newly revitalized and online journal. Thank you to outgoing members of the Executive Committee who have worked so hard, Barry Trott, Past President, and Kathleen Kern, RUSA Councilor. Thank you to the outgoing members of the RUSA Board of Directors: Chris LeBeau (BRASS), Dianna McKellar (MARS), Alesia McManus (Director at Large), Amber Prentiss (Director at Large), Janice Schultz (History), Liane Taylor (RSS), Barry Trott (Past President), and Heather Weltin (STARS). Kudos and thanks to RUSA Executive Director, Susan Hornung, and her staff, Andrea Hill, Liz Markel, and Leighann Wood, who kept us together and always give tremendous effort to RUSA. Thank you to every committee chair and every committee member in each of our sections and on our standing RUSA committees for their hard work! The summary above can only just hit the highlights. All of these folks gave their best all through the year. Bravo! And to all of you who are so loyal to RUSA, we are grateful for your participation and your confidence in RUSA. Other plans are in the works and will take shape over the coming year. You will hear more about them in later issues of the RUSA Update. I strongly encourage all RUSA members to share ideas with me or any other member of the RUSA Board. I can be reached at popp@indiana.edu and I look forward to hearing from you. RUSA is offering a multitude of online courses this fall including a new course, Interlibrary Loan 101, and CEUs offered for our Health Information 101 course. Group discounts are available! Rates for two or more registrants from the same library, library network or library system start at $110 per person. Learn more about all of our courses and webinars at the RUSA online learning page. Topics covered: ILL process, policies and procedures from both the borrowing and lending perspectives, copyright law and licensing impacts on ILL, and ILL resources and systems. Participants will learn standard practices, gain an overview of emerging trends, and practice writing policies for interlibrary borrowing and lending. Live presentations will be held Monday and Wednesday, 1:00-2:00 PM (CST), with additional asynchronous coursework. Who should attend: New ILL managers and practitioners in all types of libraries, especially academic and public libraries. Register Now This course consistently sells out, so register early! In light of the widespread use of Geographic Information System (GIS) technology such as Google Earth or Google Map Mashups o communicate information in a map format, it is time to train librarians to not only assist library clients with their inquiries, but to use the technology themselves in their reference work and liaison responsibilities. This three week course will introduce you to a variety of mapping tools and Geographic Information System (GIS) technologies that are of interest to both public and academic library users. Who should attend: librarians and library staff from all types of libraries. This course incorporates the geospatial literacy and mapping skills covered in part one of this two part course and teaches how to apply it in library services: reference work, library projects, library administration, collection delivery, instruction, outreach and promotion. Topics covered will include map literacy, staff development and training; using maps and GIS in library projects; and a basic introduction to GIS software. Register Now CEUs offered! Those who complete the required coursework will receive one continuing education unit. Registration rates for this course are $20 higher than other courses so that we can offer these CEUs for you. Topics covered include medical terminology, evidence-based biomedical literature searching, health literacy and health outcomes, how to evaluate health and medical websites, consumer health resources, and the business of healthcare. Who should attend: public librarians; primary, secondary and academic librarians. A comprehensive course focusing on the methods of evaluating reference service, behavioral aspects of reference service, and the different types of questions that can be used to help patrons identify what they need. Other topics include approachability, questioning and listening techniques and the reference interview environment. Chat sessions will model interviewing techniques using sample dialogues. Who should attend: support staff, library technicians, newly hired reference librarians, and those librarians who want to brush up on their interview skills; topics are of interest to all types of libraries. The course will provide a framework for understanding the business reference process as well as an overview of business reference sources specific to the following areas: company research, small business and industry research, international business, consumer research, business statistics, investing and the stock market. Participants will also have access to proprietary business reference databases such as Standard & Poor’s NetAdvantage, Morningstar, IBISWord and ReferenceUSA, among others. Who should attend: Academic, special or public librarians and other researchers and library staff who have a basic understanding of some business resources but who do not work with them often enough to build expertise. The course will outline basic sources and strategies, centered on a single case study, for American genealogy reference service. Topics covered include the U.S. Census, vital records, immigration research, military research, archival material, print reference tools, online sources and a variety of other basic genealogy sources. Students will also receive instruction in reference desk strategies and tools for further professional development. Who should attend: reference staff with little or no experience in genealogy, and those seeking skills and confidence for assisting family history researchers. Are you connected? Here are the ways you can stay in touch with RUSA to assure you receive the most up-to-date information on division events, publications and breaking news like book award winners. My Emerging Leaders group has been working on Chasing Reference, a blog for the members of RUSA to share ideas. We presented a poster about the blog at the Emerging Leaders poster session at 2012 Annual. Thanks to all of you who stopped by the poster. You all gave us wonderful feedback, suggestions, and encouragement. We’ll continue to post on the blog every Monday, Wednesday, and Friday until Midwinter. After Midwinter, another group of Emerging Leaders will take over the upkeep of Chasing Reference. We’re looking for guest writers to contribute posts for Chasing Reference. Chasing Reference covers a wide range of topics from mentorship to retraction in reference to readers advisory in academic libraries to celebrities who do research to collecting award winning books. If you have a program at your library that you want to highlight, or if there’s something related to reference or user services that’s been on your mind, Chasing Reference is a great place to share your thoughts and ideas. If you are interested in contributing, contact us at ChasingReference@gmail.com. We look forward to hearing from you! I want to thank you all for your support during my time as the 2012 RUSA Emerging Leader. I’ve had a really wonderful experience with the Emerging Leaders program, and I’m very grateful to have become more involved in RUSA. ALA can be very overwhelming to a newcomer. I’m glad to have found my place in RUSA. Nothing like a walk under palm trees to make a working conference seem like a vacation! That was ALA Anaheim. The weather was magnificent, and we didn’t lose too many folks to Disneyland, at least not when we needed them. The BRASS preconference, “Mastering Business Acumen (MBA in a Day),” was very well attended this year by an audience that toughed out management, accounting, finance, and marketing concepts in seven hours. Conference attendees chose from a diverse offering of programs: “Using Social Media to Promote Business Librarians and Resources,” “How Free Web Resources Can Complement Fee-Based Online Resources,” “How Private is Private: Is It Really Possible to Find Information on Private Companies?” and SmartInvesting’s “Program Models That Work.” The conference experience was topped off with the complimentary Monday morning breakfast from S&P Capital IQ, followed by the BRASS Program, “Adventures in Dataland: Business Data Sources.” ReferenceUSA (Infogroup) hosted a beautiful members’ reception at the Naples Ristorante e Pizzeria, and BRASS members ended the adventure with a dinner at La Casa Garcia Restaurant. The PowerPoint presentations from these programs and forums can currently be found in ALA Connect and will soon be linked from the BRASS website. Our many thanks for the video recordings made possible by the volunteer efforts of Van Houlson and Christy Goodnight. These are in BRASS section of Connect, and will be made public after a three month embargo as a benefit of membership. This year’s highlights included a new award (the Business Expert Press Award), revised “Guidelines for Business Information Responses,” a joint initiative with the Special Library Association (SLA) to create core competencies for business students, additional tools from Springshare, BRASS participation in a new RSS committee for Job and Career Reference, migration to a new website, new BRASS Facebook membership and program pages, new issues of “Academic BRASS,” a new “Best of the Best” business website, a new list of “Outstanding Business Reference Sources,” and the start of planning for the 25th anniversary of BRASS next year in Chicago! You will hear more about these and other developments on BRASS-L throughout the year. It has been my privilege to serve BRASS. This is a fantastic group of professionals. Together we have accomplished some great things. So with stardust on my heels, I leave fairyland and return to man the decks in my home library. My sincere thanks to all the BRASS committees who made this conference a great success and a good time. Many thanks to our supportive sponsors. I turn over the gavel to my most able friend and colleague, Ann Fiegen, from whom you will be hearing much. The BRASS Forum sponsored by the committee at the 2012 ALA Annual Conference in Anaheim on “Using Social Media to Promote Business Librarians and Resources” was well received by the 56 librarians that attended. John Gottfried of Western Kentucky University started off the session with a presentation on why experimenting with social media matters. April Kessler of the University of Texas and Chad Boeninger of Ohio University each presented inspiring examples of their use of social media in their work. The presentations are available to all conference goers in the ALA Conference Scheduler in the comments for the BRASS Forum (ALA Connect login required). They are also available to all BRASS members on the BRASS connect site in the BRASS 2012 Conference Handouts files folder. In the coming year, the committee will be working in collaboration with the SLA Task Force for Core Competencies to establish core information literacy competencies for business students. In addition, one of our committee members will be participating in the newly formed RSS Job and Career Reference Committee to represent the academic library perspective. The incoming chair, Charles Allen of Texas State University–San Marcos, will be directing the committee in these and other new initiatives as the year progresses. For questions and feedback to the committee, please refer to the contact information on the committee’s web page. Our committee is planning for the Forum at the 2013 ALA Annual. We are currently finalizing a topic. We are also working on updated Public Libraries Briefcase to be published in the 4th quarter. The BRSC met on June 22. There were ten committee members present. The committee had an agenda to obtain a volunteer as nominations coordinator, discuss the twelve works nominated as potentially outstanding or notable, finalize who would write the reviews to send to Susan Hurst for the RUSQ article, get a publishers forum update, and briefly discuss future directions. Ed Hahn, one of the new members, agreed to take minutes, and to be the nominations coordinator. Of the twelve titles nominated, six were identified as outstanding and notable. Members volunteered for the six reviews due on July 19th to Susan Hurst to edit for the RUSQ deadline of August 1st. Becky Smith will help edit as Susan will be on vacation before the RUSQ deadline. Future directions discussed were having a mix of print works, including updated or revised editions if significant, and best databases, and overlooked works which had not been reviewed before, even though the works may be in their second or third edition. Smith also mentioned that it was possible with the workload that it may be necessary to have two subcommittees. While this currently exists, there was a lot of “double dipping” of the committee members (those who did reviews and the program planning) and those who did very little. It may clarify to have specific subcommittees in order to even the playing field of the work load. On June 23rd, the Publishers’ forum was held. The theme was “How Private is Private” and covered private company information. The publishers on the panel were Bureau Van Djik, PrivCo, and Reference USA. Despite a building emergency during the presentation, the attendance was good, about 70-75 people. The BRSC is on track, and Smith would like to thank the committee members for all of their hard work. It was announced that Susan Hurst would be chair for 2012-13. The BRASS Program for the 2012 ALA Annual Conference was “Adventures in Dataland: Business Data Sources” featuring Bobray Bordelon (Princeton University), Angela Lee (Esri), Joe Nation (RAND Statistics), and Jerry Wong (U.S. Census Bureau). The theme of our program was Business Data Sources, with a focus on free and low-cost resources. The committee extends our appreciation to Capital IQ Standard & Poor’s for their generous sponsorship of the breakfast. Our program attracted a total of 120 attendees. Bobray Bordelon demonstrated resources from a variety of nonprofit and government sources, including the Consumer Expenditure Survey (CES) and American Time Use Survey (ATUS). Angela Lee discussed free and upcoming GIS resources from Esri. Joe Nation from the RAND Corporation presented several state statistical resources focusing on a wide range of social scientific data. Jerry Wong introduced the new changes to the American FactFinder and helpful ways to navigate the database. BRASS members Christy Goodnight and Van Houlson handled the audio and video recording of the full program. The video has been posted to the BRASS Section of ALA Connect for viewing by BRASS members. Marketing for the program was well received and many people “friended” the BRASS Anaheim Program Committee Facebook page started by Jason Dewland. Members of the committee are writing an article to supplement the program that will be available in the winter 2012 issue of Reference and User Services Quarterly (RUSQ). Program committee members: Paul Brothers, Laura Carscaddon, Jason Dewland, Allison Leaming, Chris LeBeau (BRASS Chair), Tony Lin (Committee Chair), Julia Martin, Peter McKay, Michael Oppenheim, and Mark Siciliano. The focus of this year’s BRASS Discussion Group was How Free Web Resources Can Complement Fee-Based Online Resources. The meeting took place on June 24, 2012, at the Anaheim Convention Center. The meeting was well attended and began with the BRASS business meeting, including announcements of the publisher’s forum, the BRASS program, and the BRASS dinner. The meeting then continued on to a discussion of various free online resources that BRASS members have found to be of use. Thanks to everyone who attended and contributed to a successful discussion. The new chair of the BRASS Education Committee is Natasha Arguello, Business Research Librarian at University of Texas at San Antonio. The preconference Mastering Business Acumen (MBA) in a Day was a success! Forty-one librarians attended the one-day workshop during ALA Anaheim. The presenters did an excellent job at teaching basic business concepts to librarians. Attendees reported that their increased understanding of these concepts will allow them to assist patrons more effectively with business reference questions. The Education committee completed transferring their popular guides: Best of the Best Business Websites and BRASS Selected Core Resources for Business Reference to the Libguides format. Please check them out at brass.libguides.com. Committee members are currently writing reviews for this year’s winners of the Best of the Best Business Websites. Chosen from a running list of over 250 websites in various disciplines, the committee is recognizing the following three websites for the important and critical information they provide on business statistical data. Committee members’ reviews are scheduled to appear in the winter 2012 issue of RUSQ. globalEDGE -Created by the International Business Center at Michigan State University, this web portal offers a wealth of information, insights, and learning resources on global business activities. Statistical Abstract of the United States – A comprehensive collection of statistics in tabular format and includes basic statistics for a wide range of economic indicators. Each table lists the source of the statistics for further reference. FRED – Economic Data from the St. Louis Federal Reserve Bank – Provides historical U.S. economic and financial data, including daily U.S. interest rates, monetary and business indicators, exchange rates, balance of payments, and regional economic data. The BRASS Vendor Relations Committee was proud this year to have secured the BRASS Business Expert Press Award for Academic Librarians. In our role as the ad hoc award committee, we were pleased to select Joel Glogowski from Georgia State University from among a large and impressive pool of nominees as the inaugural recipient. We have been continuing to assist the BRASS 25th Anniversary Planning Committee by reaching out to new vendors and working with longtime partners to help secure funding for the celebration event planned for 2013 in Chicago. Other ideas for connecting to and collaborating with BRASS vendors in order to provide additional value to BRASS members are in the works. The Publications and Communications Committee met at Anaheim to review projects from the previous year and look at possible goals for the coming year. The Committee spent much of the first half of 2012 converting BRASS Web pages to the new Drupal format, then reviewing those pages to update information and identify problems. While we have made a good start, much work remains to be done. As new chair of the committee, I will contact our new and existing members to discuss distribution of responsibility for updating and revising BRASS Web pages. The committee is also open to other new projects. Plans are underway for a BRASS 25th Anniversary Party to be held at the 2013 ALA Annual Conference in Chicago. Keep your calendars open for this fabulous event. Stay tuned for details to come over the next year. They will study business librarians’ involvement in the evaluation and approval of new academic programs in business. We thank Gale Cengage Learning for the generous support of this award. “I am extremely grateful to Gale Cengage Learning and BRASS for providing me with the opportunity to go to the ALA Annual Conference in Anaheim, California. The conference was an enlightening and exciting experience. It benefited me greatly professionally. 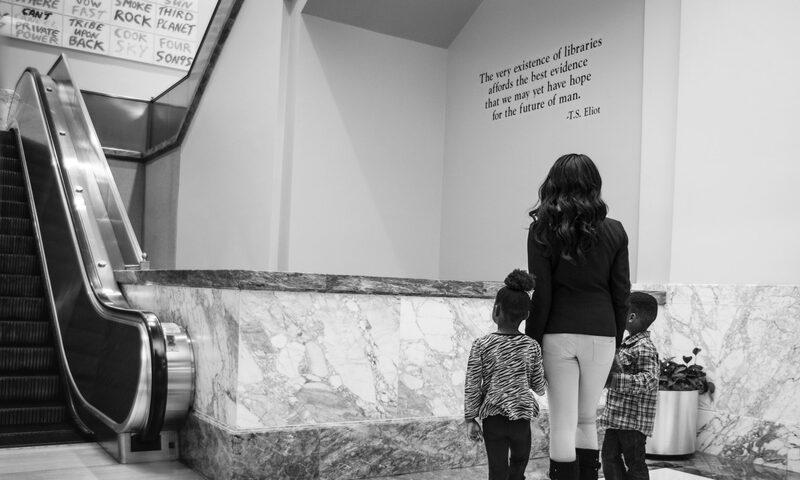 “Attending the ALA annual conference gave me many opportunities to network with my new colleagues and reconnect with old ones. While at the conference, I met many librarians who gave loads of useful advice for a librarian just starting out. Sometimes just sitting next to someone on a bench can be a great moment for serendipitous interaction. At one point I took a brief break between sessions on a bench and had a 30 minute conversation with a San Francisco public libraries manager who gave me several new ideas for social media and makerspaces projects. I also ran into librarians from my undergraduate and library education as well as recent alumnae from my library school. “I also had the chance to network with other business librarians just like me. It was especially good to talk to other new business librarians who were going through similar adjustments to their new jobs. Some of the new business librarians I met even connected after the conference and are planning to have monthly “meetings” to build upon the relationships we started at ALA.
“For a recent graduate like me, transitioning from student to practitioner can be very intimidating and awkward. I am often not always sure where to make connections and with whom. The whole BRASS group treated me like a local celebrity throughout the conference and really went out of their way to include me and introduce me to other members. By the end of the conference, I felt very much like part of the group. I haven’t volunteered for any committees, but I did learn much more about the committee structure that I could ever have gleaned from reading ALA Connect pages. With what I learned at the conference, I feel like the whole process is much more approachable and there are many different ways that I could contribute. “My favorite part of the conference was the BRASS discussion group. This was also my favorite part of last year’s conference as well. The discussion was very informative about free data resources, but I really love seeing the passion that Business Librarians have for their patrons, their sources and their work. The Morningstar Public Librarian Support Award committee was glad to have Anne MacDonald, Business Librarian at Poudre River Public Library presented with the award at Annual. The committee is looking forward to accepting candidates for the upcoming year. The Award Committee, Vendor Relations, and Executive Committee have given thoughtful consideration to the status of this unfunded award for an extended period of time. The Award Committee recommended and the Executive Committee voted to disband the award. A broader award, perhaps related to some aspect of diversity, may be considered in the future. Good personal investment education is important for librarians and library staff. We are an occupational group that is rarely able to access top financial advice. In this program, investment professionals will demystify the process and help us understand essential principles and how to apply them to make better decisions to meet our retirement goals. The presentation will include a discussion of the common mistakes investors make, why we make them, and how to avoid them. Rotblut is a vice president of the American Association of Individual Investors. He is the editor of the AAII Journal. He authors the weekly AAII Investor Update e-newsletter and his commentary is published on both Seeking Alpha and Forbes.com. Christine Benz, Director of Personal Finance, Morningstar, Inc.
Benz is director of personal finance for Morningstar and author of “30-Minute Money Solutions: A Step-by-Step Guide to Managing Your Finances,” published by John Wiley and Sons in January 2009. She is also editor of Morningstar Personal Finance, a monthly personal finance newsletter and writes a column on Morningstar.com. The CODES Board voted to sunset the CODES Materials Reviewing Committee. The committee existed only to review and update the document “Elements for Basic Reviews.” After the discussing the usefulness of this resource, the board felt that there was little evidence that these guidelines were being used in the profession. As most review sources define their own review, the board felt that this detailed document was increasingly irrelevant, and that neither the committee nor the guidelines were necessary to meet the strategic directions of the section. The recommendation was sent to the RUSA Board. Following the CODES section review at Midwinter 2012, it was decided to review some committee structures and to merge the Collection Development Education Committee and the Collection Development Planning and Assessment Committee. The new committee will include members from both existing committees. The CODES Education Committee posted a bibliography drafted by the committee on Collection Development Education Resources. Please consider nominating a library or library system for the 2013 Gale Cengage Learning Award for Excellence in Reference and Adult Services. The award consists of $3,000 and a citation. At ALA Annual 2012, the committee honored the Richland County South Carolina Public Library Job Center. A list of previous recipients along with award criteria and the nomination form can be found on the RUSA site. The closing date for nominations is December 15, 2012. It’s hard to believe another Annual Conference has come and gone. It was good to see many of you at the conference, and I know those who weren’t able to attend were there in spirit. We’re looking forward to another great year for MARS, the Emerging Technologies in Reference Section of RUSA! Many thanks go out to Dianna McKellar, our chair for 2011-2012, to Anne Houston our Past Chair, and to Carolyn Larson, Shannon Jones, and Erin Rushton, not to mention all those who served as members and chairs of our committees this year, and to all our invited presenters. We couldn’t have done it without you. If you are interested in joining MARS or learning more about the Emerging Technologies in Reference Section, please contact one of us. We welcome all members, those who can meet in person as well as virtual members. This year we have a new committee—the User Experience Design Committee. They’re just getting started but their mission will be: “To identify and study issues relating to user experience (UX) design as it relates to emerging technologies in library public services, and to evaluate and promote integration of UX methods and philosophies in all types of libraries through technological and service standards, guidelines, and “best practices.” The chair for that committee will be Missy Clapp. If you are interested in joining this committee, please contact me. 1. Continue to increase opportunities for virtual participation in the work of the Emerging Technologies in Reference Section. MARS membership is strong, but many of our members cannot regularly attend conference. Virtual meeting technologies, supported by RUSA, enable us to get more work done outside of the MidWinter and Annual face-to-face Conference meetings. In the coming year, the Executive Committee will work with each committee to identify ways to support more virtual projects and to recruit virtual members to contribute to the committee projects and goals. 2. Continue to increase professional development opportunities for members of the Emerging Technologies in Reference Section. Professional Development is critical in the Emerging Technologies in Reference arena. The Professional Development Committee has already begun this task, creating webinars and free preconference workshops. In the coming year, work closely with RUSA to expand ongoing virtual offerings. 3. Maximize the effectiveness of RUSA by working closely with our parent organization and the other sections within RUSA to coordinate our virtual activities. Through representation on RUSA level committees, coordinate ideas and create new synergies to help RUSA and the Emerging Technologies in Reference Section most effectively reach current members, providing them with opportunities for meaningful service and professional development, and most effectively recruit and retain new members. 4. Revise and update the MARS Handbook to optimize format and information for web presentation. 5. All MARS Committees will contribute to the 2013/2014 MARS Section Review. The Section Review will be due to RUSA in February 2014. The committee reviews will be completed by Annual 2013. Many of the committees and discussion groups have included summaries of their conference activities in this issue of Messages. To find out more about these presentations, don’t forget to check out our website: http://www.ala.org/rusa/sections/mars, or look for our postings on ALA Connect. The MARS Achievement Recognition Certificate Committee selected Carolyn Larson, Head of the Business Reference Section, in the Science, Technology & Business Division at the Library of Congress as “My Favorite Martian” for 2012. The Committee would also like to invite MARS members to send nominations for the 2013 Award to the Committee’s incoming chair, Stephanie Graves, at sgraves@lib.siu.edu by December 1, 2012. The MARS Achievement Recognition Certificate is given annually to recognize excellence in service to MARS. This award is given to an individual who is a current member of MARS, and has been an active member for the past two years. The recipient must have made either (1) sustained contributions toward attaining the goals of MARS, or (2) a single, significant contribution that has resulted in a positive impact upon the work of the section. This year, attendees of the Annual MARS Happy Hour enjoyed perfect weather (it was southern California, right? ), hors d’oeuvres, drinks, and a relaxing poolside ambience at the Annabella Hotel near the Anaheim Convention Center. EBSCO generously sponsored the event, making possible the delicious hors d’oeuvres enjoyed by all. Over eighty people chatted about the work of MARS while catching up with old friends and getting acquainted with new ones. A moment was taken out of the informal event to acknowledge Carolyn Larson, this year’s My Favorite Martian honoree, as well as to thank the MARS leadership who led the Section through another great year. Alas, no one chose to bring a swimsuit and actually jump in, but it was a very nice party by the pool nonetheless. Learn to conduct virtual meetings and present webinars using Blackboard Collaborate! This online platform is new to RUSA and available to all MARS members. The MARS Professional Development Committee will be offering a series of training sessions on Blackboard Collaborate to teach the basics of navigating, and using some of the features such as the whiteboard and sharing screens. Each session will be 90 minutes at 1:00 PM Central Time (2:00 PM Eastern Time and 11:00 AM Pacific Time). Training dates are: August 17, August 31, September 14, September 28, October 12, October 26, November 16, November 30, and December 7th. MARS PD Co-chairs Van Houlson and Nancy Cunningham will be leading the training sessions. Please feel free to contact Van or Nancy with any questions. The Products & Services Committee reviewed five products associated with recording library interactions. The software reviewed included: Reference Analytics, Desk Tracker, Gimlet, Google Analytics, and creating an Access database. These reviews are posted on the MARS blog. The MARS Local Systems and Services Committee program “Discovery Systems: The Promise and the Reality” was extremely successful. We had over 100 people in attendance. The speakers shared their experiences with discovery services such as Serial Solutions Summons, Ex-Libris’ Primo and EBSCO’s Discovery Service. The MARS Best Free Reference Websites for 2012 have been notified and the complete list is now available on the MARS website. Voted for by member librarians from around the United States, the twenty-six web sites were selected from seventy-seven sites nominated this year. These sites have been recognized by MARS this year as an outstanding site for reference information. The complete list of MARS Best of Free Reference Web Sites of 2012 is now available on the MARS site. We would like to congratulate these sites and thank them for providing quality information. We would also like to thank the committee for the terrific collection of web sites that were nominated and for their participation in selecting the best sites for 2012. I am honored and humbled to chair the section that focuses on frontline reference issues! As the chair of the Reference Services Section, I look forward to working with each and every one of you to continue the great work the former leaders of this section have started. Speaking of former leaders, I have big shoes to follow (and Liane, it doesn’t matter if they are only a size 5!). Many, many thanks go to Liane Taylor, outgoing chair of RSS. I can go on and on about Liane’s work but it is really evident in all aspects of RSS and many facets of RUSA; if something has become more efficient or effective, you can bet Liane was behind it! In interests of space, I will focus on just two things that Liane has done to ensure that our section is streamlined, efficient, and effective. Liane is responsible for the detailed Chair Orientation Manual. She added a calendar that has been instrumental in helping the section to document and record the sections history. It includes setting goals for each committee, which ensures that the section continues to be viable and applicable to individuals involved in frontline reference. Furthermore, she saw the need for an RSS Archivist. You will see Cindy Levine, the RSS Archivist, listed as a co-chair of your committee; she is not a co-chair but is quietly working behind the scenes to make sure that the section stays organized. She has created categories within ALA Connect for each committee to record minutes, goals, current activities, and rosters. I would be remiss without mentioning the leadership of Joe Thompson. Let me mention one of his many contributions (and there are many!) to the section. Through his leadership as chair of Organization and Planning he was the mastermind in making a fundamental, and I would argue fun, change to the RSS Annual Open House. At the Open House in Anaheim we debuted a trivia contest. It was through Joe’s thoughtful deliberation that the trivia contest was a success and included awesome prizes! We will miss Joe but rest assured he is still involved in RSS as a member of the new Young Adult Reference Services (YARS) Committee, a committee he was instrumental in creating. So, you might be wondering what you can expect from me. First, I would like to welcome Ann Brown as the RSS Chair Elect. I look forward to working with Ann who is sharp, considerate, collegial, and fun; I believe we will make a great team! Regarding RSS this year, I would like to focus on our members and what they have done for the section. We already have the RSS Service Achievement Award which honors a member for either a sustained contribution towards attaining the goals of RSS or a single significant contribution that has resulted in a positive impact upon the work of the section. Furthermore, you can become a prestigious member of the RSS Honor Roll. If you have served RSS in three or more different capacities, let the RSS Recognition Committee know! See http://www.ala.org/rusa/sections/rss/honoroll for the current members of this esteemed list! More recently, we have published the RSS Members Publication List. Please let us know what you have published by filling out the form here. This is a way to showcase the activities of RSS Members and it also serves as a resource for you! Finally, modeling after ACRL’s Member of the Week, I would like to implement RSS Member of the Quarter. This will coincide with the RSS Review and will feature a short interview with an RSS Member. Stay tuned via RSS-L for more information. To conclude, I look forward to the year ahead and getting to know each of you. Please don’t hesitate to contact me (hammills@fiu.edu) with questions or ideas on how to improve the section. If I don’t know the answers, I have a great team (which includes all of you) to ask! The Catalog Use Committee hosted a Roundtable Discussion at ALA Annual in Anaheim. The group had planned out five distinct discussion topics for the meeting, with a moderator for each topic. Finding e-Resources: an idea sparked by this article in the September issue of the Journal of Academic Librarianship, “Usability Testing for E-Resource Discovery: How Students Find and Choose E-Resources Using Websites.” (p. 386 Fry, Amy). Catalog Accessibility: Access issues confronted by marginalized user groups such as the elderly, the disabled and children. Open Source Systems: Are they the future or a distraction? New Technology and the Mobile Landscape: How to make sense of new technology, platforms and devices. New Cataloging Standards and Resource Discovery: How will the new Sears subject headings and the RDA (Resource Description and Access) standards impact librarians and library users? A focus for the Catalog Use Committee this coming year will be to look at the impact of Ebooks on the Library Catalog and best practices for displaying information about accessing and downloading on various devices, number of users, check out periods, along with other themes. As chair, I am looking forward to a fantastic year of leading the charge for this committee. Great reference skills are a true asset in any job but crucial for librarians. The Discussion Forums Coordinating Committee sponsored two really exciting Forums at Annual. “Rethinking Your Reference Collection,” moderated by Christy Caldwell, had twenty-three attendees and a very lively discussion about the use and fate of print reference collections. Participants were both academic and public librarians and discussion covered topics from decision-making to dealing with staff resistance. Our second Forum, “E-Access and Patron Bleed,” moderated by Nicolette Sosulski, covered a common feature of virtual reference services—assisting patrons from anywhere in the world with topics your local collection may not support. Eight public and academic librarians found a lot of common ground in this forum, discussing how their services deal with the expectations of patrons far outside a geographical or topical area. The Discussion Forums Coordinating Committee did not meet at ALA Annual 2012. The committee’s meeting for the annual conference was conducted via email in May when the winning forum proposals for the conference were chosen. Work is progressing on coordinating a joint in-person workshop at ALA Midwinter 2013 with the Education and Professional Development for Reference Committee (EPDRC) and MARS Professional Development Committee. The workshop, “New Tech for Reference: From the Reference Interview to Roving Reference, Challenges, Benefits and Best Practices,” will be held Friday, January 25, 2013 from 1:00-5:00 PM at the University of Washington Odegaard Library, room 220. Topics include: Twitter, Facebook, and social media for reference, iPad/roving reference and using a Knowledge base, like LibAnswers, in reference. Over the next year the EDPRC will be reviewing syllabi from ALA-accredited LIS programs to review what content is covered in reference courses. This will aid in future directions for the committee. The committee hosted a lively discussion forum at 2012 Annual, “The How, What, and Why of Reference Evaluation and Assessment,” moderated by committee members Ellen Keith and Jason Kruse on Saturday, June 23. We had seating for fifty and at one point, all fifty seats were filled! In our discussion of who was doing assessment and what tools were being used, interesting paths were shared. Assessment in some libraries is formalized to the point of having an assessment librarian or director. Besides tools like READ and LibQual, some libraries are using the Secret Shopper approach; some have created a rubric to assess undergraduate papers where the undergraduate has visited a librarian. Decisions being made with assessment data inform staffing, services, and best use of time. It was a fascinating discussion and we thank all who attended! The first meeting of the Health and Medical Reference Committee was held at the all RSS meeting at ALA annual. The committee discussed new health and medical reference guidelines, the program that the committee will hold at ALA annual in Chicago in 2013, possible webinars that could be sponsored, and ways to communicate health reference issues with the broader librarian community. Karen Vargas brought several documents that would be helpful in the creation of the guidelines and an online page will be set up where people can post additional resources as a first step for the guidelines. Panelists were proposed for the 2013 program on serving the health information needs of a diverse community. The committee agreed that they would like to work on a quarterly series of RUSA webinars, beginning with one on basic resources for medical reference. The inaugural meeting of the Job and Career Reference Committee was held July 2012 and the following members attended: Kate Oberg (co-chair), Jennifer Hootman, Gergana Kostova, Samantha Soucy, and Arlene Weismantel. The charge of the committee is: to offer programming, forums for discussions, and professional development opportunities focused on providing services and outreach related to patrons’ jobs and career needs, including library resources and reference assistance; guides, tutorials, and web content; programming, promotion, and instruction; and effective community partnerships. he RSS Library Services to an Aging Population Committee sponsored a program at the ALA Annual Conference in Anaheim: “How Libraries Are Meeting the Evolving Needs of Baby Boomers and Older Adults.” Over 100 people attended the program, which included presentations by Susan Hildreth (IMLS), Jane Salisbury (Multnomah County Public Library), Tony Sarmiento (Senior Services America), and Suzanne Flint (California State Library). The program included a lively question and answer period, in which various viewpoints on serving these populations were expressed. If you would like slideshows from the program, you can view them online at TransformingLifeAfter5.org. The Library Services to the Spanish Speaking Committee is planning a discussion during ALA 2013 Midwinter with a speaker from a public library to present their children’s program. The session would include a demonstration of their story hour, in addition to a discussion of the marketing of similar programs and why community health organizations seemed to be more popular to promote services such as story hours to the Spanish community. The presentation will be in English and Spanish. Other activities for this year may include a review of the Guide to Services to the Spanish and another review article potential on case studies of Spanish speaking library use. The Management of Reference Committee met twice in Anaheim at ALA Annual. At the first meeting William Weare, Chair, reported that the Guidelines for Behavioral Performance of Reference and Information Service Providers revisions now needed approval from the Standards and Guidelines Committee and then final approval from the RSS Board. We discussed the Professional Competencies for Reference and User Services Librarians. At the most recent Midwinter meeting, the discussion session did find value in the Professional Competencies for Reference and User Services Librarians, but the Committee isn’t sure whether they were referring to the Guidelines for Behavioral Performance of Reference and Information Service Providers. Because of other problems the Committee sees with them we agreed that the original document should be sunsetted and this Committee should focus on updating the professional competencies for managing reference services and departments. William brought this plan to the RSS Board who approved it. Our committee sponsored a workshop at ALA Annual, “Let’s Work Together: Integrating Social Media, Online Marketing and Outreach” with David Lee King, Marshall Breeding and Jennifer Robinson. Liane Taylor assisted with on-site organizing and reported that the workshop went well. As mentioned in our prior update, for ALA Annual 2013 in Chicago, we are pleased to collaborate with two other committees to co-sponsor with the RSS Virtual Reference (VR) Committee Chair Don Boozer and MARS co-chair Ellen Filgo a proposed workshop: ” Slam the Boards: A Model for Marketing Through Action.” This would be presented by Bill Pardue and may include an expansion of the concept of “guerilla marketing techniques for VR” (as Don put so well). We may shift this workshop to be a webinar prior to June’s conference, with a discussion forum at the conference. We’ll know soon which way we’re taking this. We’re excited for an active new year! The RSS Organization & Planning Committee will be working closely with the RUSA Executive Committee over the next year to continue to improve the effectiveness of the section. We will also be following up on feedback we’ve received over the next year, updating the handbook, reviewing the bylaws, and creating several surveys. The Research and Statistics Committee hosted the 18th Annual Reference Research Forum on Sunday, June 25. This year’s presenters were Lili Luo presenting “Best Practices of Text Reference Service: A Synergistic View,” Susan Gardner Archambault and Kenneth Simon presenting “Apples and Oranges: Lessons from a Usability Study of Two Library FAQ Web Sites,” and Alison Graber, Alison Hicks, Caroline Sinkinson, and Stephanie Alexander presenting “Research Assistance Interactions: Exploration of Users’ Motivation and Perceptions.” The committee also combed the literature to select exceptional articles detailing research in reference for the Reference Research Review: 2011. The RSS/MARS Virtual Reference Services Committee held its official meeting at ALA Annual in Anaheim on Saturday, June 23, as part of the RSS All-Committee meeting. Twelve people were in attendance. One of the primary goals of the meeting was final planning for the committee’s sponsored program held on Saturday, June 23, at 1:30-3:30pm: “Are Virtual Reference Services Worth the Effort? What ROI Analysis and User Evaluations Tell Us”. The program was successful with approximately 150 people attending. We are also looking at a change in our official mission statement to fold in the charge of the now-disbanded Cooperative Reference Services Committee to “To identify and study issues relating to virtual reference services, and to evaluate and promote technological and service standards, guidelines, and ‘best practices’ for local and cooperative virtual reference services in all types of libraries.” We will be working with MARS and RSS to accomplish this. The committee will be considering a Wikipedia edit-a-thon at either Midwinter and/or Annual. The committee plans to conduct their official midwinter meeting virtually with a time to be determined. After receiving training from Louise Gruenberg and with her assistance as well as that of Sean Bires and Andrea Hill, the VR Tutorial Subcommittee has begun populating the new resource in Drupal. The Planning Module now includes what used to be the Policies Module and is complete. The Training Module is currently in progress. The Resources section is a work in progress and we will add to this, as well as Tips & Best Practices and Activities, as we work on the modules. We will be reorganizing the Resources by topic, instead of alphabetically. We are awaiting permissions from ALA so we can populate the Welcome page. The subcommittee continues to meet monthly and works in subgroups between meetings. We will be brainstorming about the Interview Skills Module next and a subgroup will take ideas from that meeting and implement into Drupal content. We plan to continue to work this way until the resource is complete, hopefully by next year’s annual conference. 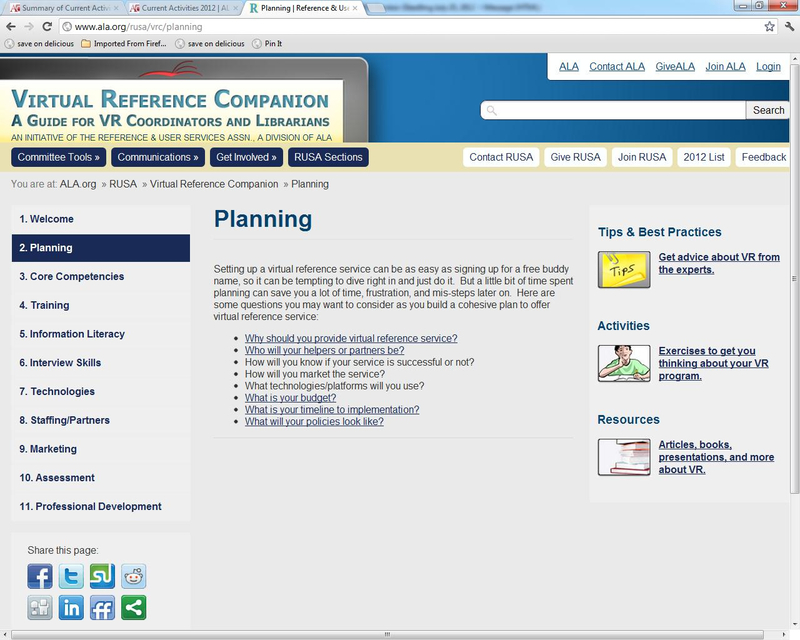 We decided that “Virtual Reference Tutorial” does not fit the resource anymore and have renamed it the “Virtual Reference Companion: A Guide for VR Coordinators and Librarians”, or VRC for short. The subcommittee would like your help in making this resource be as useful as possible. We will be sending out a survey in the near future to request tips & best practices, activities, and resources in regards to virtual reference that we may be able to use for the VRC. We will greatly appreciate your input. The newly minted Young Adult Reference Services (YARS) committee held a lively and informative discussion forum at 2012 Annual. The varied group of attendees points to the importance of reference services to this demographic. Fifteen participants talked about teen/young adult reference-related topics that ranged from assisting with research to marketing reference services to tweens, teens and undergrads (and the difficulties therein). Plans are to continue offering discussion forums at conference and online while building name recognition and growing the committee’s membership from within YALSA and RSS. RSS Review is the newsletter of the Reference Services Section of Reference and User Services Association (RUSA) of the American Library Association. Please send suggestions for future issues to Amy Rustic (aer123@psu.edu), editor. Hello STARS and friends of STARS. I do hope this finds you well. I’m David Atkins, the 2012-13 Chair for RUSA/STARS. As both chair and a STARS member, I am looking forward to another fun and productive year in service to resource sharing professionals everywhere. For this year, STARS will build on our successes in research, education, and training. Along with our midwinter and annual programming, STARS will launch an online interlibrary loan training course. We’ll also start using online tools that support virtual meetings. Over the next two-three years, RUSA will channel resources to fund programming and promotional activities among RUSA and all its sections. STARS will capitalize on any and all opportunities fund diverse professional development programs and give you more value for your time, energy, and dues. If you would like to become involved in our dynamic section or have questions out what STARS can do for you and your library, please drop me an email (datkins@utk.edu) or give me a call (865-974-6866). There is always room for more STARS.